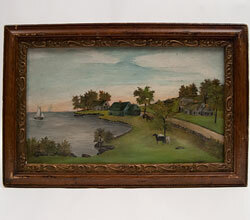 Circa 1900-1920: This charmingly naive Massachusetts shoreline landscape depicts an idyllic summer day on the coast with horses, a fisherman, sailboats, houses, barns, trees, and a quaint country lane and showcases prominent and progressive 19th century theologian, philiospher, and university president W. F. Warren's artistic capabilitie, leaving no doubt that Warren was himself a true renaissance man. 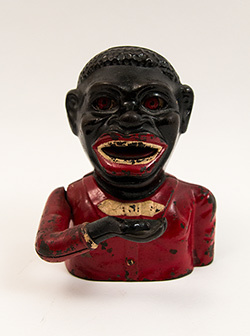 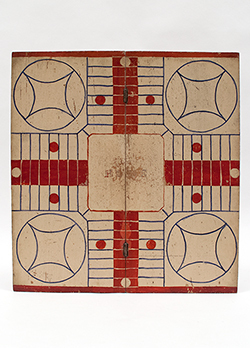 This wonderful and important piece of Boston University history would fit well in any collection of American folk art or items pertaining to Massachusetts, Boston, or Boston University itself. 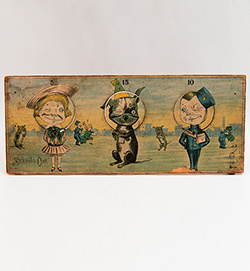 Circa 1903: McLoughlin Brothers second version of the popular question and answer game with moving pointing finger under glass. 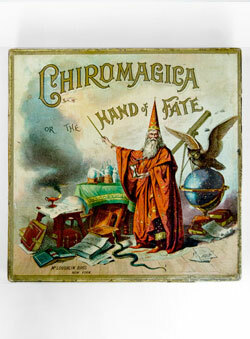 Striking wizard and eagle atop a globe by the premier chromolithographers at McLoughlin Bros.
Circa 1920s: Measuring a substantive 60" wide by 15 1/2" tall, this beautiful four-color cut out River Room trade sign in its original custom made metal frame almost certainly hung in the River Room, a cafe in St. Paul, Minnesota's famous Dayton's department store. 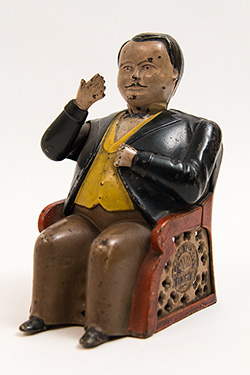 Circa 1892: It is more than safe to say that the Jolly N is the most popular mechanical bank ever created because no other mechanical bank has been made in more variations, manufactured in more nations, or produced for a longer span of time. 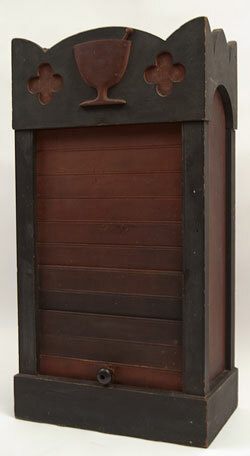 Here is a fine example of Stevens' version of the Jolly bank. 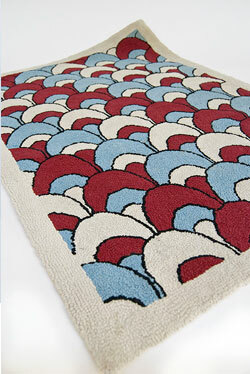 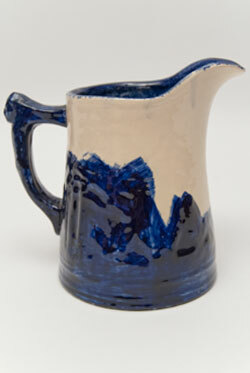 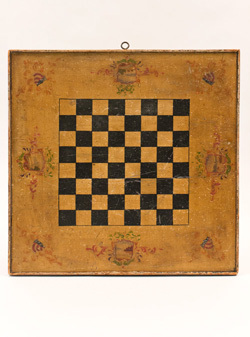 It is completely original with no chips, cracks, or repairs and retains its original painted surface. 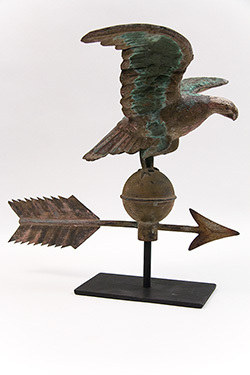 Circa Late 19th Century: This classic 26" Harris and Company Blackhawk weathervane from Boston MA is constructed of molded copper but for its zinc ears. 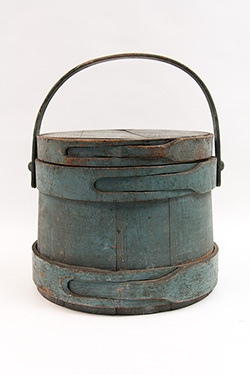 The vane is 19 1/2" tall mounted on its museum stand and has an appealing surface. 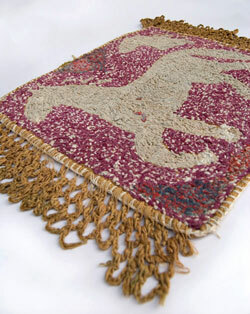 Two bullet hole repairs are evident on the mane under close inspection, and there are some minor age appropriate indentations. 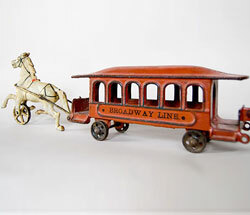 The conditon, patina, and originality of this handsome 19th century Boston MA weathervane from one of the premier manufacturers of its day is absolutely superb. 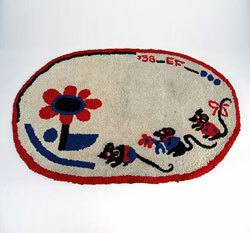 The 26" size highly desirable because it can fit just about anywhere in the house and still make quite a statement. 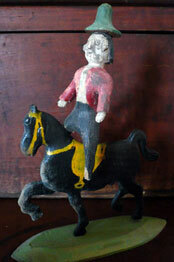 The weathervane is modeled after Blackhawk (1833-1856), an infamous trotter who sired 1,722 foals, including the storied Ethan Allen. 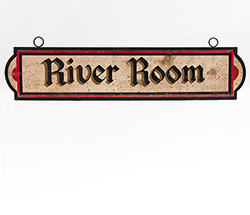 Nautical Boat Sign: Great, vibrant colors and skillful craftsmanship make these smaller signs a decorating delight. 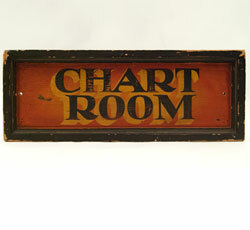 Obviously painted by a signmaker, these old boat signs in yellow, black and orange boast a great original surface and unsurpased visual appeal. 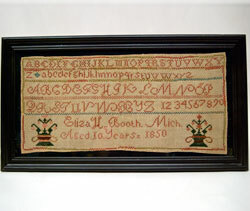 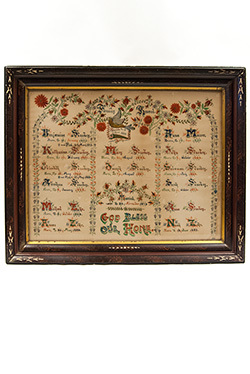 Circa 1882: Antique American hand painted fraktur. 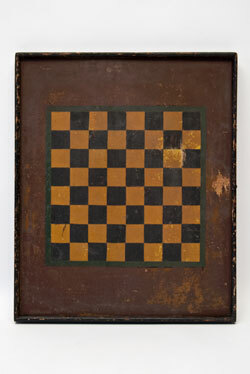 Measures 28" x 22". 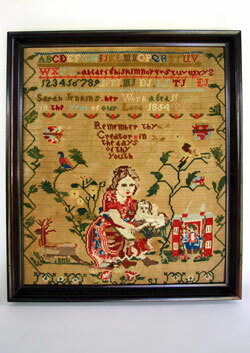 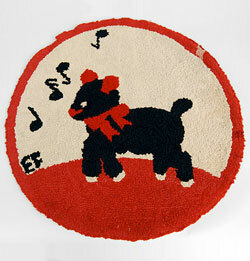 All original Family Record with painted bird, large red flowers, vines and other motifs. 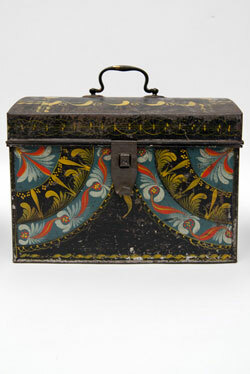 Striking Red, blue and green with applied gold and exquisite attention to detail with the abundant flourishes of decoration. 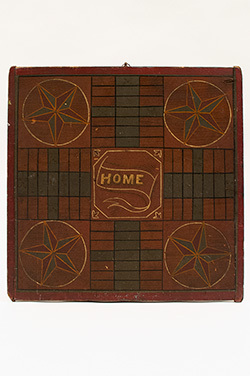 Housed in a period Eastlake frame with acid free backing between the original board backing and painting. 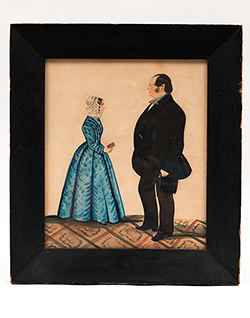 Circa 1850: Because Illinois did not become a state until 1818 and was considered rugged territory until after the Civil War, fine antebellum Illinois oil on canvas paintings are scarce indeed, and having identifed sitters makes this pair of potraits of William Clark (1808-1888) and Margaret "Mary" J. Clark, nee Black (1804-1876) an exceptional find. 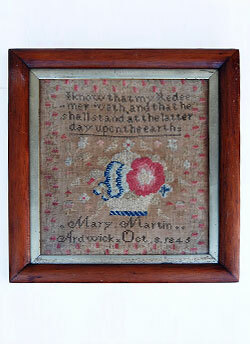 The inscriptions "Painted 1850" and "Mary J. 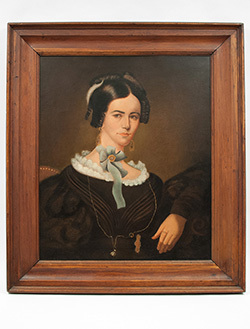 Black married William Clark of Monmouth Ill. 1838" are impressed into the back side of the frame of Mrs. Clark's likeness. 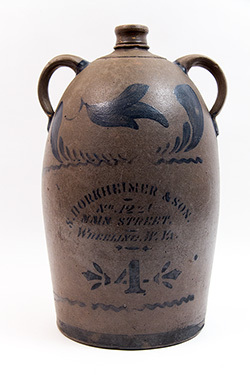 The Clarks had one child, James B. Clark (1841-1907), who served in the Illinois infantry during the Civil War and later became a lawyer, and William Clark is documented as being Monmouth Township's assistant supervisor in 1865. 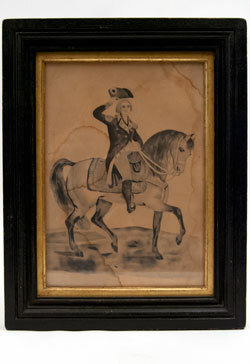 Both William and Mary Clark are buried in Monmouth, Illinois. 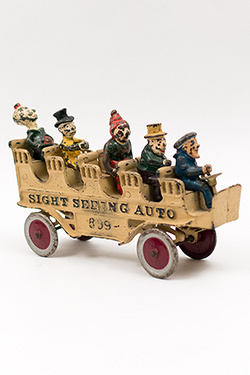 This striking couple is clearly well to do as they are dressed in upscale fashions of the day and Mrs. Clark is pictured in all her finery, an indication the Clarks spared no expense in the execution of their likenesses. 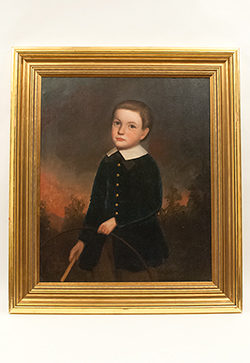 Although the canvases are unsigned, it is obvious that the anonymous painter had great skill and was a seasoned portrait artist. 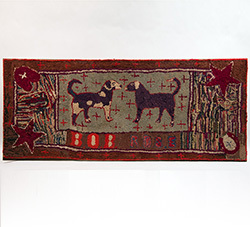 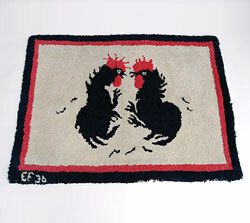 These wonderful examples of Midwestern folk art have resided in a private collection for the last 20 years. 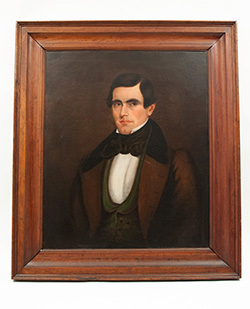 It is not often one has the opportuity to own market fresh museum quality 19th century Illinois folk art, and it would behoove the advanced Midwestern folk art collector to give these handsome portraits serious consideration. 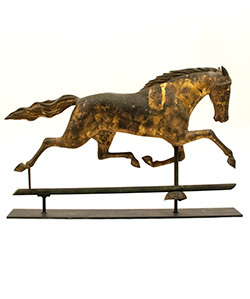 Circa Late 19th Century: This 27" Harris running horse weathervane is constructed of molded gilt copper, has zinc ears, and is stamped "HARRIS and Co." in tiny letters on one side of the horse. 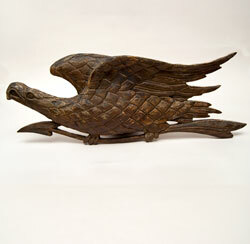 The vane is 18 1/2" tall mounted on its museum stand and has a superb original surface. 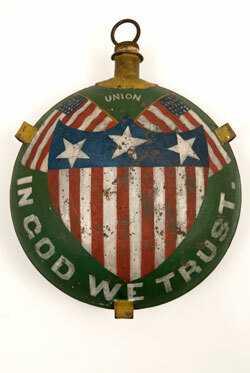 A single bullet hole has been repaired on one side of the weathervane. 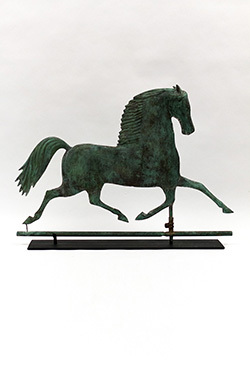 The conditon, patina, and originality of this handsome 19th century Boston MA weathervane from one of the premier manufacturers of its day is absolutely superb. 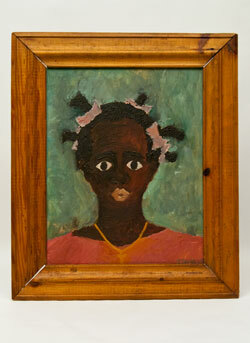 Circa 1965: This wonderful 16" x 20" outsider folk art portrait housed in its orginal 23" x 27" pine frame depicts a young African American girl in a pink dress with pink ribbons in her hair and a gold cross around her neck. 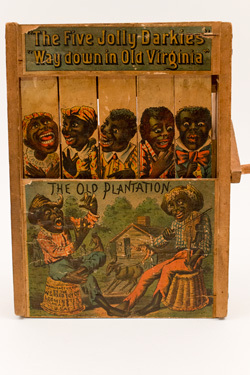 Found in a farmhouse in Southwestern Indiana between Terre haute and Vincennes, this painting was created in 1965 when the civil rights movement was heating up in the cities across America. 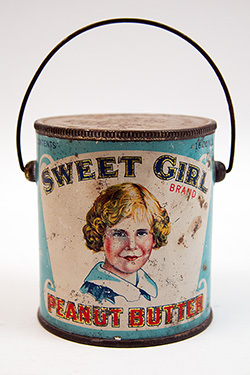 Note that this painting is not a depiction of stereotypical black Americana but is that of a young Christian black child with a surprised, yet sad and almost frightened expression on her innocent face, making this work reminiscent of the black church bombings happening in the 1960s American South. 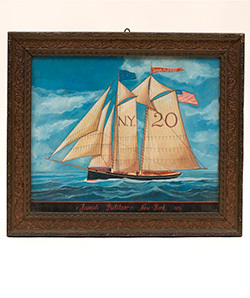 This finely done oil on board also hearkens both the complexity of Cezanne's island portraits and the violent naivete of Jean Dubuffet's brute art. 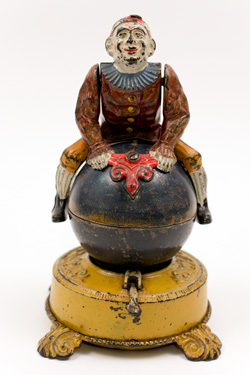 Very nice, working, original condition on this Antique Mechanical Clown on Globe Bank. 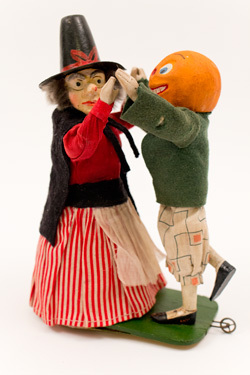 Yellow based version also sports a unique ruffle, hat and costume combination. 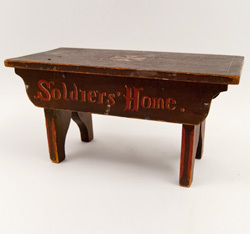 Circa 1880s: This patriotic footstool was made in a Soldier's Home by a disabled Union veteran of the Civil War, retains its original polychromatic painted surface, and measures in the neighborhood of 12" wide and 10" tall. 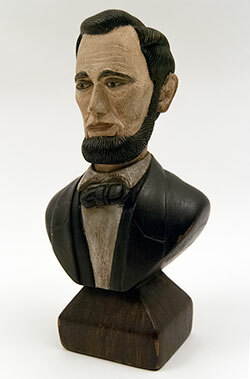 Circa 1900-1920: Measuring 9 ½” tall and 5” wide, this exquisitely rendered and beautifully painted one piece wooden bust of President Abraham Lincoln is a prime example of the patriotic folk art created around the celebration of our 16th President’s 100th birthday in 1909 when sparks of nationalistic pride ignited across the country. 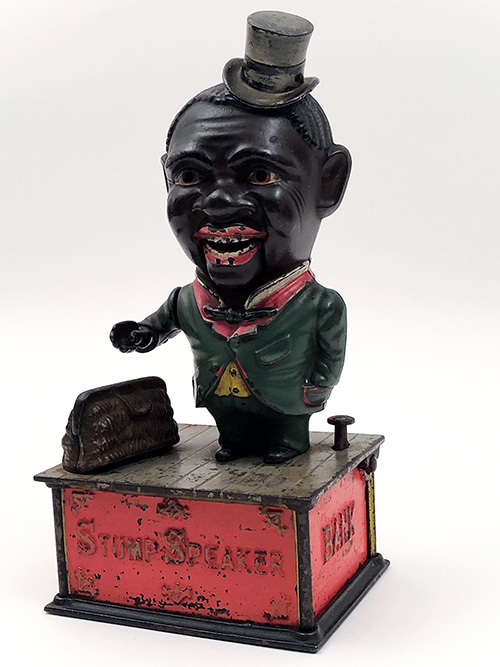 Lincoln’s bust was even unveiled on the penny that year, and other images of our first assassinated leader appeared on prints, advertisements, bookends, pottery, and a wide assortment of mass-produced goods. 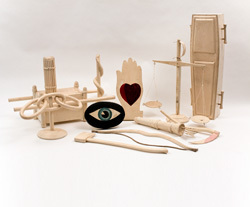 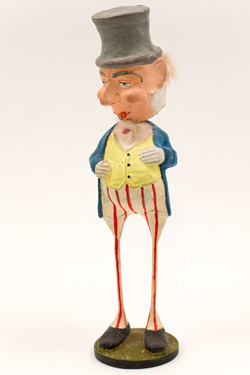 It follows, of course, that anonymous untrained American folk artists also paid tribute to Honest Abe with their one of a kind handmade objects. 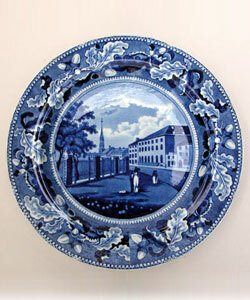 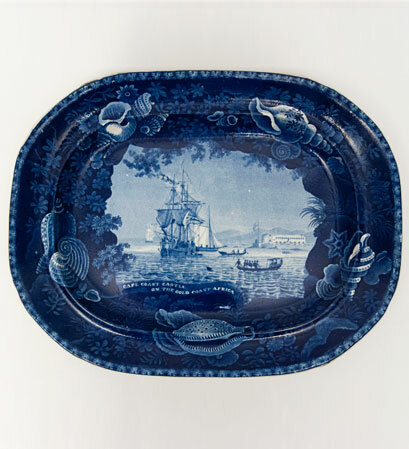 Circa 1820-1840: This stunning Enoch Woods historical Staffordshire platter in the highly desirable dark blue transfer with classic shell border depicts ships anchored just off Cape Coast Castle, which was used in the early 19th century transatlantic slave trade that delivered slaves from Africa's Gold Coast to American shores .It is difficult to find early items related to the American slave trade, and this platter is an important representation of how the labor force that helped build our cities and plant our fields came to America. 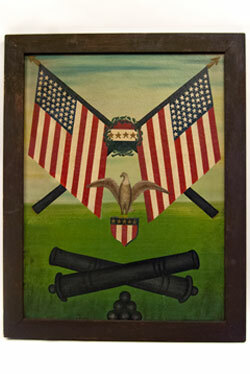 Circa 1880s: Oil on canvas Americana painting with eagle on sheild, flags and cannons. 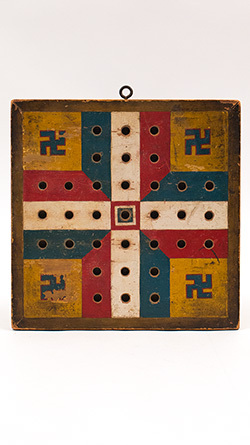 Great whimsical and naive composition repeating cross shapes. 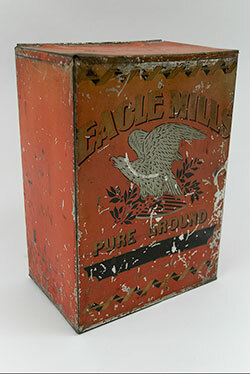 Circa 1900-1925: This handsome red and white striped antique Barber Pole has great visual appeal and is small enough to fit just about anywhere. 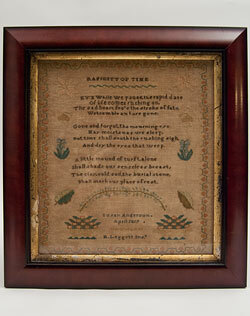 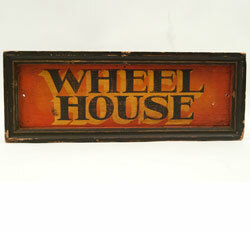 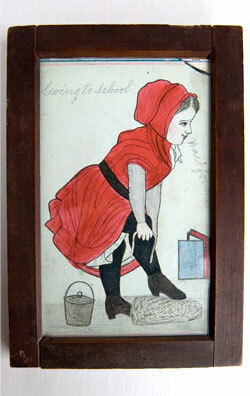 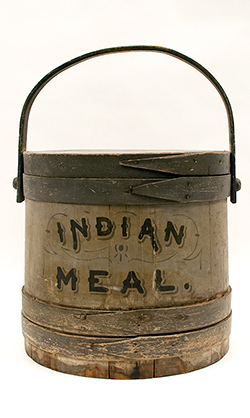 This fine early trade sign will compliment any collection of American folk art or Americana. 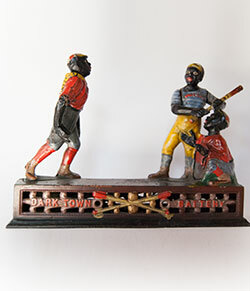 Circa 1890-1910: Measuring 24" X 9" and grasping an arrow in its talons, this fine late 19th or early 20th century hand-carved pine war eagle was discovered on an old building in Ipswitch, Massachusetts and shows a weathered surface appropriate for its age. 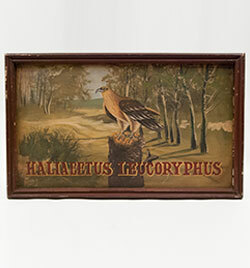 Note that the our nation's symbol is presented with its wings spread, making it seem as if the carving is soaring across the skies with an arrow in tow.